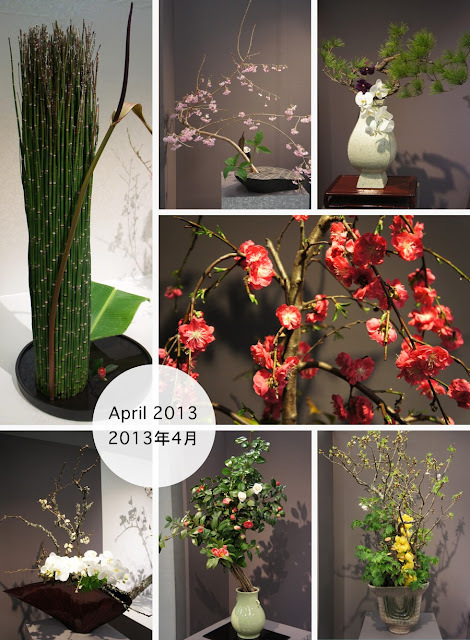 When I was planning our spring trip to Japan, one of my mum's specific requests was, "I want to see some ikebana." 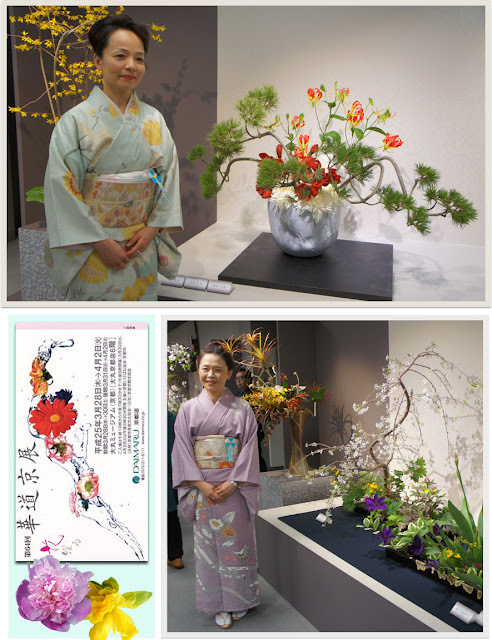 My mother is very interested in gardening and flower arranging, and I've dabbled a little in ikebana, too. 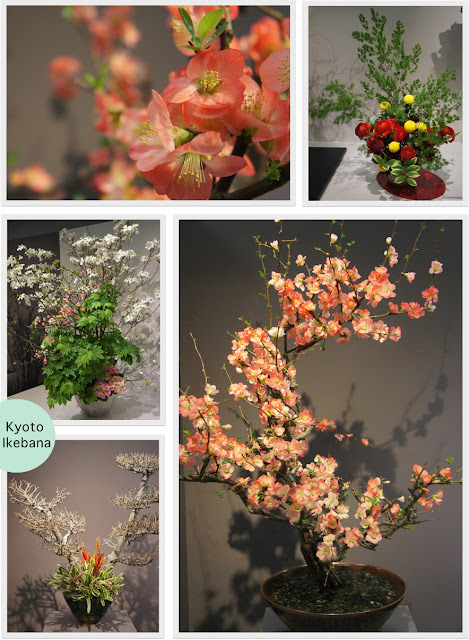 I started researching Kyoto ikebana schools to find out where we could see some arrangements, but I couldn't find anything that looked likely. A couple of the schools' websites specified "visitors permitted on invitation" but that was no use to us. Thanks to a Tweet from Visit Japan, I found a listing of special events in Kyoto, including a big ikebana show that overlapped with our visit. Perfect! The exhibition seems to be an annual one hosted by the Kyoto Ikebana Association (華道京展). The spring timing is surely to take advantage of the national blossom frenzy that is late March-early April in Japan. We rode the Kyoto subway to Daimaru Department Store. 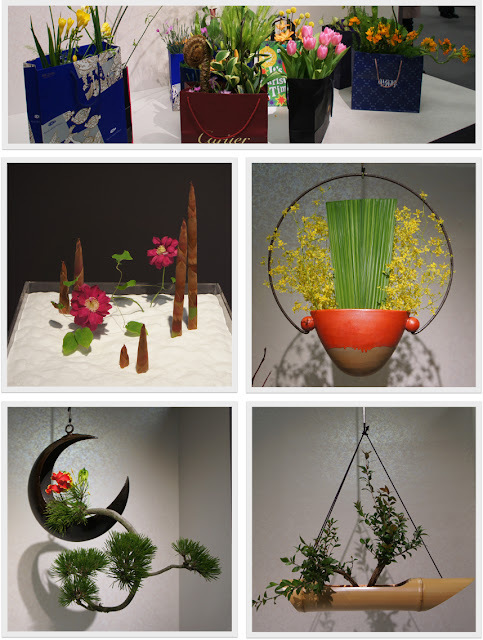 In the eighth floor Daimaru Museum, we discovered a paradise of flower arrangement. 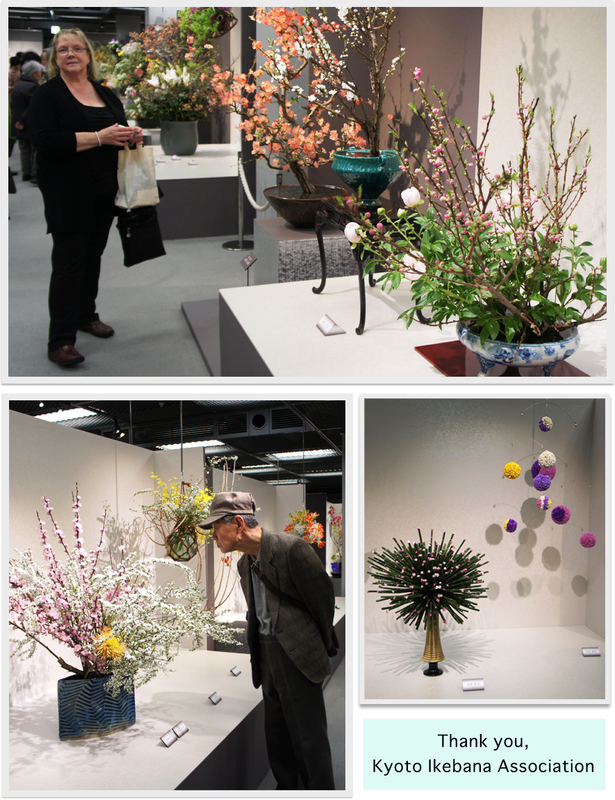 I was amazed by the variety in form, colour and materials. 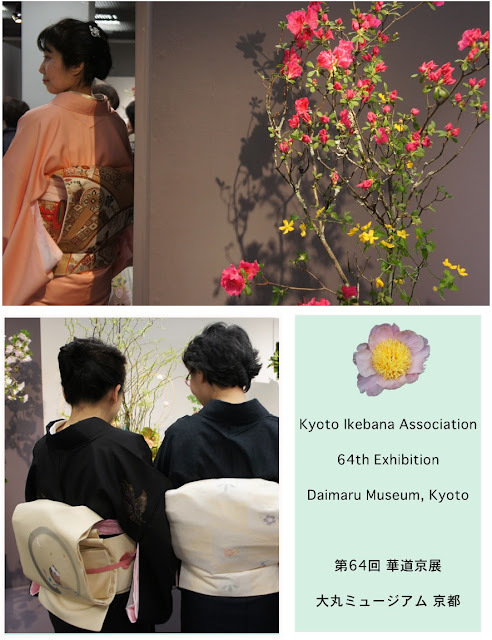 The artwork had been created by members of 34 different Kyoto ikebana schools, so we we were able to see a wide array of ikebana styles. "I expected the arrangements to be more stark, formal and composed of fewer elements but these arrangements were exuberant and bountiful. They weren't formal but flamboyant, and they did not seem to be created following any strict rules. The artists must have been aiming for beauty, influenced by the cherry blossom season which is also so exuberant and bountiful. Ladies dressed in their kimono proudly stood beside their creations while we took photos, looking just as beautiful as what they had created." We were very fortunate to see this exhibition - it ran for only five days. In the crowd of flower viewers that afternoon, we were the only westerners in attendance. Quite a number of people I chatted with thanked us for coming. This suggests to me that the exhibition was not expected to draw any foreign tourists, so I feel even luckier that I managed to find out about it. As the trip planner, I was really happy and relieved to be able to fulfill one of my mother's Japan wishes.